This is the sound of a middle guard smashing the guy in front of the quarterback. Lloyd Constantine played middle guard at Williams College. He litigated like a middle guard as an antitrust lawyer. Now, nursing a mocha latte at Starbucks, he’s making the sound to illustrate what that means: No artifice. No finesse. Just straight hits. Just – puhssscht! He’s also inspired other labels: Icono clastic. Arrogant. Gruff. You should care about all this because when his cellphone rings, the person he’s often speaking his mind to is his protege, friend and tennis rival: Eliot Spitzer. Constantine is senior adviser to the governor. He’s a consigliere with carte blanche to attend essentially any meeting. He’s also a policy person who spent months on the administration’s examination of this question: How can SUNY rival the “public Ivies” in states like California and Michigan? The ideas Constantine supports could shake up a system accustomed to what University at Buffalo President John Simpson called an every-child-gets-a-favor, one-size-fits-all approach to setting policy and dividing money. Constantine wants flagship campuses. Superstar academics. Schools liberated to charge different tuitions. Some dislike and even loathe his goals. Spitzer hasn’t publicly embraced all of them. But the state, one scholar said, hasn’t seen its governor stress SUNY to this extent since Nelson A. Rockefeller transformed it. More than a generation later, Constantine argues that pumping money into higher education could pay dividends beyond academics, from improving New York’s economy to revitalizing its cities. Whether Spitzer can pull off that play is an open question. The financial anchor of his long-term plan, a $4 billion endowment from leasing a chunk of the state Lottery, needs legislative approval. Republican Senate Majority Leader Joseph L. Bruno was noncommital when the Times Union asked him about it recently. Ronald Canestrari, former head of the Assembly Higher Education Committee, wel comed the focus on SUNY but worried that Spitzer, now promoting his higher education plan, has raised expectations too high. Constantine delivered in the legal world. Under Attorney General Robert Abrams, he galvanized state antitrust enforcement. In private practice, he stitched together a coalition of retailers to sue Visa and MasterCard for trying to monopolize the debit card market. But he’s new to three-men-in-a-room Albany government. Can he get results for higher education? Friends praise his willingness to “crawl into the bowels of the record” while other lawyers would leave grunt work to their minions. He can be a persuasive advocate, one whose speech sounds more Upper West Side than upstate and who sometimes touches your arm to stress a point. “Generally, when he puts his intellect to something, he has a very successful result,” said Pamela Jones Harbour, a Guilderland-raised Constantine protege now on the Federal Trade Commission. In government, he’s charming with people he needs to work with to get things done, said one colleague. He built a relationship with Sen. Ken LaValle, the Long Island Republican who heads the Senate Higher Education Committee. But some also say he has little use for those not in power. He can be icy to people he considers inferior, a colleague said. He seems to look through them, even. Coordinating Spitzer’s higher education policy, Constantine has shown dedication and directness. He trekked to all 64 SUNY campuses, down to the tuberculosis-ward-turned-classroom at North Country Community College. He traveled in his BMW SUV and thought of the trip like a triathlon: I’m gonna do it. I’m gonna do it in record time. I’m gonna do all the driving myself. One feeling he does not generally inspire is ambivalence. The Spitzer-Constantine friendship feeds on the whatever-you-do-I-can-do-better rivalry of two competitors “finding their other,” as Constantine put it. Constantine was the attorney general’s antitrust chief when a Harvard Law student named Eliot Spitzer walked into his office as a summer intern in 1982. Over the decades, Constantine worked with Spitzer as a law partner, donated to his campaigns and led his transitions to attorney general and governor. 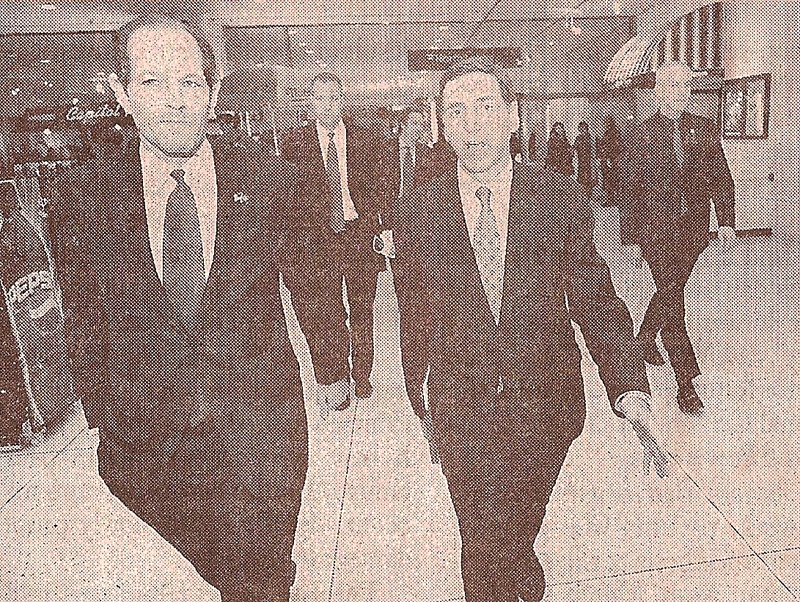 He also represented Aon Corp. when the insurance brokerage was targeted by Attorney General Spitzer. “No you didn’t,” said Spitzer. People who know Spitzer know Constantine is “one of those people who comes with the governor,” said Lt. Gov. David Paterson. Constantine could spend his days playing tennis at his private Chatham court. Or he could relax at his Manhattan apartment with some fiction by his beloved Philip Roth – or by his son, Isaac, who just completed his first novel. He’s reached the stage of life where he might spend all his time worrying about his three grown kids. Avoiding that, he said, was one of the reasons he took the $155,000-a-year job with Spitzer. He professes a distaste for political work. But the consequences of politics have become his business. The senior lawyer has represented the executive chamber through probes into the administration’s alleged efforts to tar Bruno over his use of state helicopters. He prefers policy. In higher education, he drafted an executive order that created a commission on improving SUNY and CUNY, vetted people Spitzer appointed to the panel, and served as its bridge to the administration. Greatness, he said, takes “transformative events.” Like paying a $668,000 base salary to University at Albany nanotechnology chief Alain Kaloyeros – SUNY’s Alex Rodriguez. Constantine jokes about “cloning” Kaloyeros. As it happens, Kaloyeros walks into Starbucks as he’s talking about all this. The academic, wearing a black collarless shirt unbuttoned at the top, comes over. Constantine tells the professor his campus looks like “something from the Martian Chronicles.” He also mentions the cloning remark. “He’s a masochist,” Kaloyeros says. Staff writer James M. Odato contributed to this report.